Do you find yourself experiencing trip withdrawal? Have you missed the sound of Kenny’s spirited voice in the morning? Do you long for trail wisdom and positive reinforcement? Never fear. Now you can bring the voices of Kenny Fuhrer AND Peter Walker into the comfort of your own home. 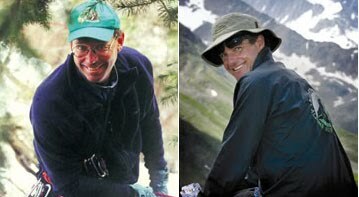 Maribeth Clemente, a Telluride, CO-based author and travel expert, recently interviewed Ryder-Walker’s own Peter Walker and Ken Fuhrer for her radio show, Travel Fun, and now you can replay the show as many times as you like. Listen through your smartphone. Play the show on your computer. Let the voice of Ryder-Walker ring through the woofers and tweeters of your home stereo system. A podcast of the program is now online at Maribeth’s website: bonjourcolorado.com. You’ll hear Peter and Ken talk about the founding of Ryder-Walker, the things that have made us successful, affiliate companies, summit champagne-toasts, and more. The show is a half-hour long, so pour something tasty, then sit back and enjoy! Oh, and don’t worry about your trip withdrawal. It’s a natural thing.